Last week, Jeopardy! host Alex Trebek poked fun at a contestant named Susan Cole over her taste in music, describing nerdcore hip-hop artists as “losers” because they rap about video games and science fiction. Cole took it well, laughing along with Trebek as he admitted that he was “just teasing,” but—to nobody’s surprise—internet people who take themselves very seriously interpreted Trebek’s comment as a vicious attack on an entire genre of music that he’s too old and uncool to understand. Of course, that take on it ignores the fact that Trebek is usually a lot more open about it when he doesn’t like a Jeopardy! contestant, especially when it involves them doing or saying something he doesn’t approve of, but whatever. People were angry, and a basic familiarity with Alex Trebek’s shtick wasn’t going to make it go away. 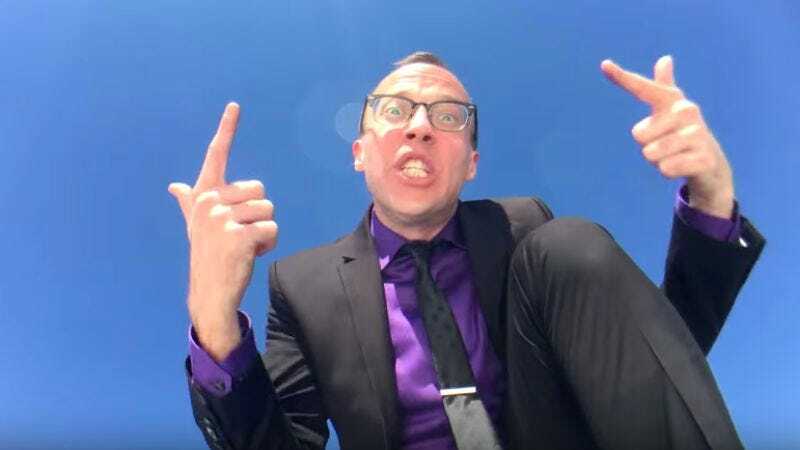 Now, some titans of the nerdcore scene have banded together to shut Trebek down and put him in his place with an epic diss track that features MC Frontalot, Schaffer The Darklord, MC Hawking, MC Lars, Dual Core, and a few other people with similarly rad noms de nerdcore. Most of the verses are playful and self-aware, poking fun at Trebek while also poking fun at themselves, but there does seem to be some actual anger here and there (“No one likes a know-it-all, condescending blowhard / Easy to be snarky when you’re holding all the note cards”). You can see the full lyrics at the YouTube page.